Published 2003 by Down East Books. Essentially as new. Cover and inside pages are nice and clean. "It is a well-kept secret that people love cemeteries," says Karen Batignani, "and the interest in them is growing rapidly." 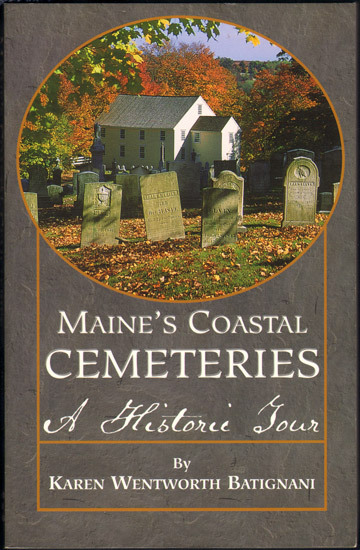 In this guidebook, she presents thirty-eight of Maine's most beautiful, historic, and interesting coastal cemeteries, each described in a lively and informative way. Descriptions include their locations, as well information about unusual epitaphs, notable carvings, historically relevant details, folklore, and stories about well-known stonecutters, prominent people, and war veterans. She also delves into a brief history of New England graveyards, changes in headstone styles through time, and how those styles reflect changes in cultural attitudes toward death. She even includes advice on graveyard etiquette and photography tips. This guide is indispensable to anyone interested in graveyards, graveyard art and photography, or history; and it's a perfect way to discover some less well-known places to visit in Maine."